Detailing the physical features, habits, territorial reach and other identifying qualities of the Elderberry Borer Beetle. 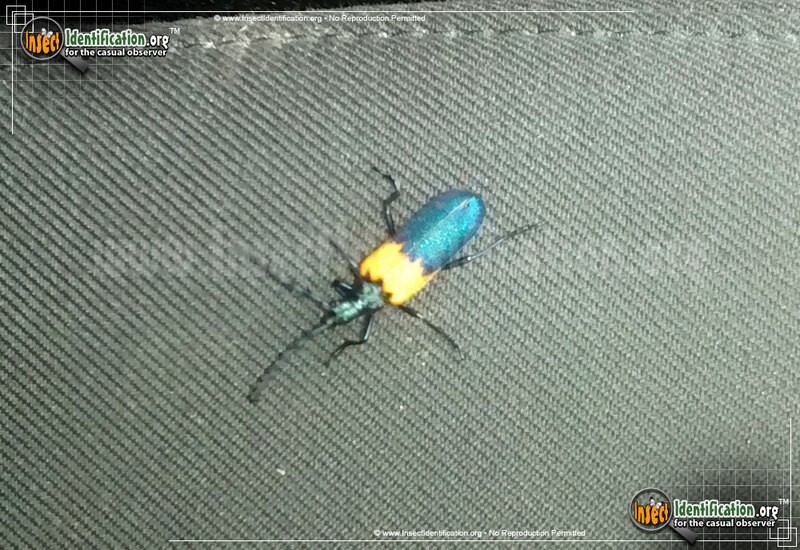 The yellow and blue colors on the Elderberry Borer Beetle are striking and unusual, just like the fruit of their host plant. The colors on the abdomen of this species are uncommon among most beetles. The top part is bright yellow and the lower part is a metallic blue. The blue may range from dark navy to bright royal blue. The head is black. Adults have black antennae that are about as long as their body. They are often found on the flowers and leaves of their host plant and namesake, elderberry. They are most likely to be seen during late spring and summer. Elderberry Borer Beetles are native to eastern and central North America. Eggs are laid on elderberry bark, branches and leaves. Hatched larvae bore their way into the center of the stems to feed on the plant's juices. They leave behind frass (insect excrement) that resembles wood shavings. As they mature, the larvae continue to bore down to the roots of the plant where they will pupate. It takes approximately two years to develop into an adult.